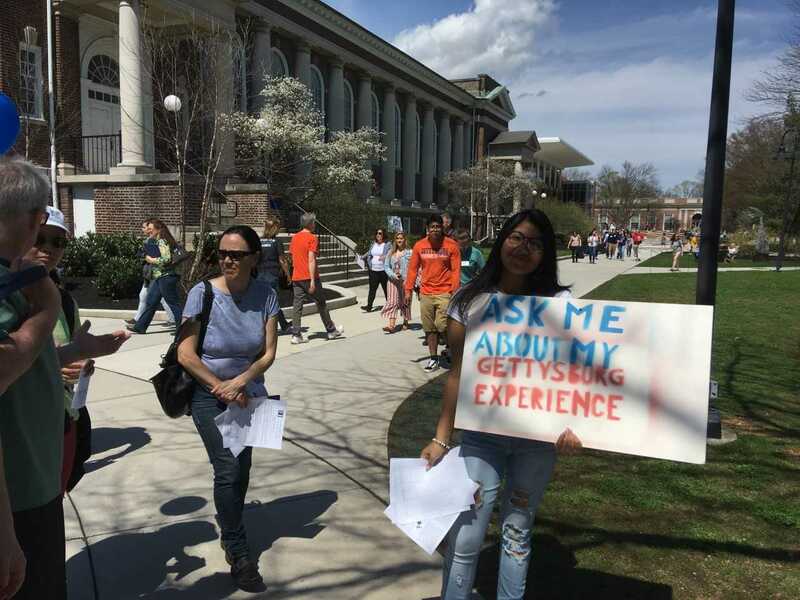 Students Hold ‘Ask Me’ Demonstration on the Tour Guide Path of Get Acquainted Day | The Gettysburgian. During Get Acquainted Day (GAD), Saturday, Apr. 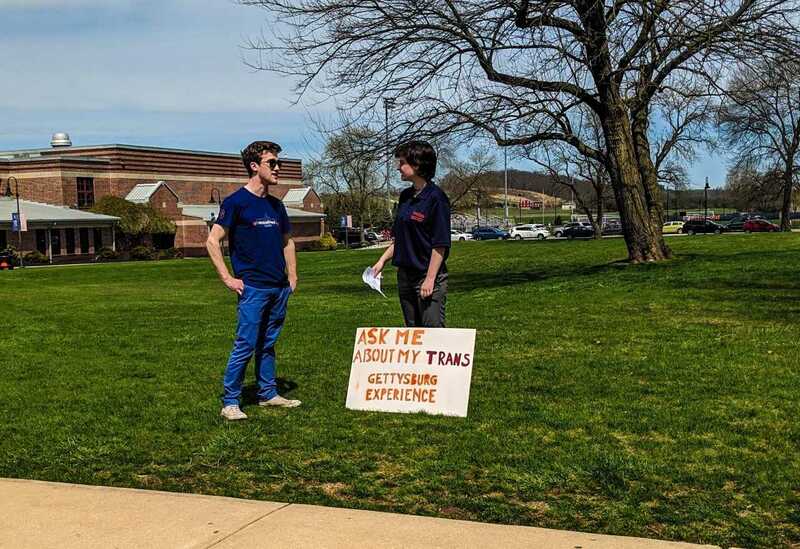 13, a group of students stood on campus outside of Servo and all throughout the pathway of the tours holding signs stating “Ask me about the Gettysburg Experience” with specific statements of their personal experience, like being a woman in the economics department or being a transgender student on campus. Students also held petitions to sign and have gotten signatures both from current and prospective students. In addition to the tour pathway, students were also stationed around Stine Lake and other main pathways in the center of campus, sharing their experiences. 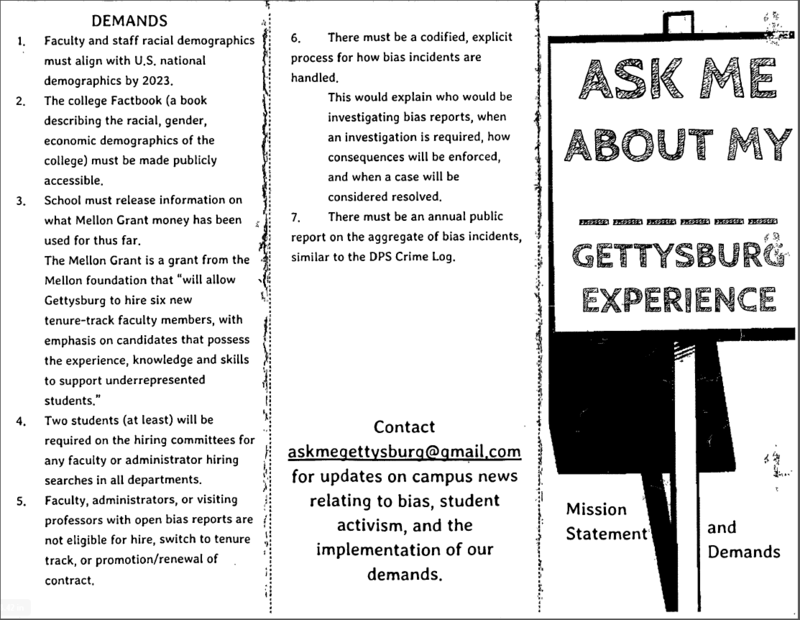 The group plans to take their demands to the college and ask for a more diverse and inclusive Gettysburg. Director of Photography Mary Frasier contributed to this report. I really applaud the students for this and I agree that the college tries to paint its best picture for GAD just like every other college/university during days like these. At the same time I saw two students on campus arguing over a certain issue. Not even conversing, arguing. This is a problem because if you want people to be an ally to your cause, you don’t shame them. You don’t make them feel bad. You try to understand each other’s views. You invite them to and event, and they invite you to an event. Lets try to understand each other first. Lets look at Daryl Davis for inspiration on how to handle different views. Anne Perry ’21 needs to transfer to another institution of higher learning where she (?) can be happier. Acknowledge your privilege. Not everyone has the resources to transfer. Western education was not made for marginalized people. Western education was made by and for the wealthy, white man. Although education has become racially integrated it is still not a system for marginalized peoples. Racial integration is not sufficient. We need gender, race, LGBTQA+, socioeconomic, citizenship status, ethnic, and neurodiverse representation. To suggest an easy solution is to forget where you stand in life. We may all live on the same planet but our realities are more different than you imagine. Current student here just wanting to point out that this protest is about issues beyond just what GAD is showing prospective students. While these issues are hidden – as would be expected on a day where a lot of students attending are either in the final stages of choosing their college, or have already done so – they are often neglected to the point where we have to take action like this. The issue goes beyond us not being happy with how things are here, its that despite our efforts, the college does little to nothing to improve upon what we have brought up. Realistically speaking, the college can do a lot more if they chose to even recognize some of the issues at hand. 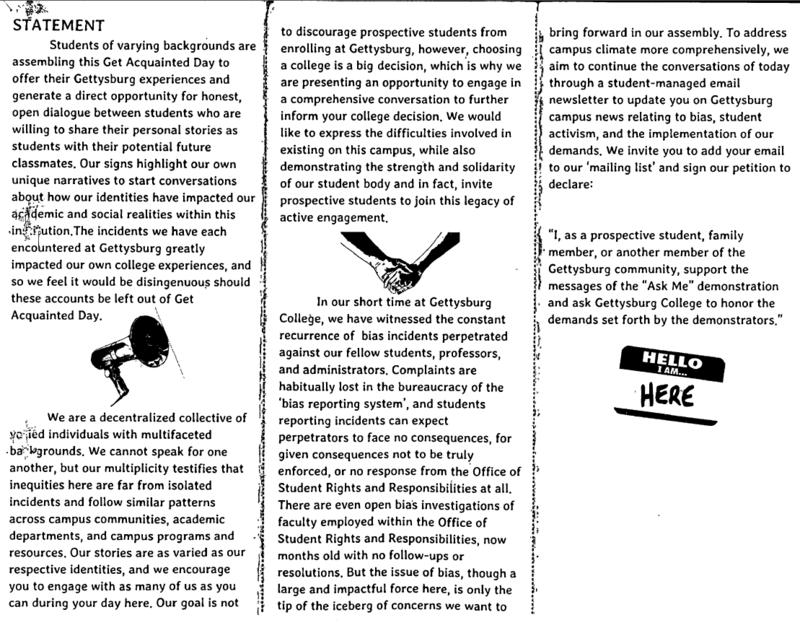 There have been multiple instances of issues within the bias reporting system (as mentioned in the pamphlet shown above) not only of ignoring issues, but of showing bias within themselves. From a personal perspective I’ve seen how clearly the bias system favors, to speak realistically if bluntly, the rich, white, heterosexual side of campus. I’ve seen bias incidents against fraternities get swept under the rug, and even outright ignored, when those issues pertain to homophobia, islamophobia, racism, etc. Meanwhile, when a member of the queer community says something about fraternities (granted using violent language, but also not realistically and on their private social media page) they are hounded for months, forced to jump through multiple hoops, and made a villain out of it. So people who are being treated poorly based on their sexuality, gender, race and religion are given nice words, but no actions, meanwhile someone acts ‘biased’ against a fraternity (and for the record, being a fraternity is not an ‘identity’ or means to be biased against like those mentioned above) gets hounded and harassed by the people who are, by the college’s words, supposed to be there for us. We’ve even had issues with the man who runs the Office of Student Rights and Responsibilities being biased against the LGBTQ+ community, and outright transphobic, issues which have been completely ignored for months as of now. Even outside of the bias issues, the college has a tendency to ignore its issues up until their reputation is at risk. The biggest example of this in my time here thus far is when Hanson Hall was found to have black mold in it – over spring break after part of the freshman population, myself included, had been living there for an entire semester – and our living situation was disrupted as a result, with many of us having to stay in hotels so they could fix it mid-semester. I myself have lasting issues which my time in the black mold infested building has been attributed to. The college acknowledged that something happened, but was not going to give the students affected any compensation, only taking minor action when the student senate began to discuss suing the college. Even then, we got a $250 payment (when housing costs ~6,000) and ‘priority housing’ for the next year. These issues have happened in the past year and a half, and more has happened before I came here, things I wasn’t made aware of until I was already here. Our goal was to make sure that incoming students are aware of what’s happened and how things work, rather than the ideal that the college paints for one weekend. They should know the reality of what they’re getting into, rather than what the college wants them to think. In response to John Deere, while that is a nice sentiment, it is not a realistic one given the situation we are in. If we could all sit down and solve our issues together, demonstrations like this wouldn’t be necessary. But the reality is, despite our best efforts, these are the kind of things that need to happen for change to occur. We’ve tried inviting administrators, faculty and staff to our events, and more often then not we get a “this was a nice event, you spoke well,” and “we’ll look into it” only for nothing to happen. We get pretty words, but no actions to back them up, so we instead chose to take action ourselves. In response to what Dave Riechert said, a lot of us see this as beyond our personal happiness, and recognize that even if we leave this campus to find a potentially better place, there are going to be so many students like us who are going to end up in the same situation all over again. While we’re aware that there are places we could be happier, we also recognize that if we do nothing here, Gettysburg isn’t going to get better for those who don’t realize how things are before coming here. We recognize that we’re not the only ones who have been and will be in this situation and as such, we’re doing this for past and future students as much as we’re doing it for ourselves.